This week the nun discussions turned in a new direction. Sadie wanted to see every picture of every order of nuns that we could possibly find. We poured over the pictures of the Holy Spirit Adoration Sisters (because they wear pink). Mae was down for one of her rare naps, Patrick was alternating between playing on the floor and napping, and we sat down with the computer and began watching YouTube nun videos and searching through nun pictures. After pouring over pictures of pink habits there was a particular order that she began obsessing over. "The light blue nuns! What are the light blue nuns called? You know, the one's that we see walking out of the cathedral sometimes." Now after a few dozen google searches and visiting the diocesan website and lots of helpful suggestions on the facebook page where I asked if anyone had any guesses what order she was talking about and then watching a YouTube video that showed what looked to be hundreds of orders with Sadie saying, "nope, that's not them" after each group wearing blue I was fairly certain that the answer was "diocesan sisters" since they talk about them on the diocese's website (unfortunately no pictures), we've seen them at the cathedral and we can't find any orders that are even close to the same light blue but not pale blue or turquoise or royal blue color. She finally said "yes that's them!" about an order with turquoise habits, and, after two hours of searching I gave a little cheer, even though I knew they weren't the sisters we'd seen walking out of the cathedral. I asked her if she wanted to be one of the light blue nuns, after about an hour of nun pictures, and she said something like: "No of course not. I want to be a Carmelite." in a tone that conveyed that my question was rather ridiculous because the answer was so obvious, how could I even think such a thing, even after an hour of searching to find out what they're called. 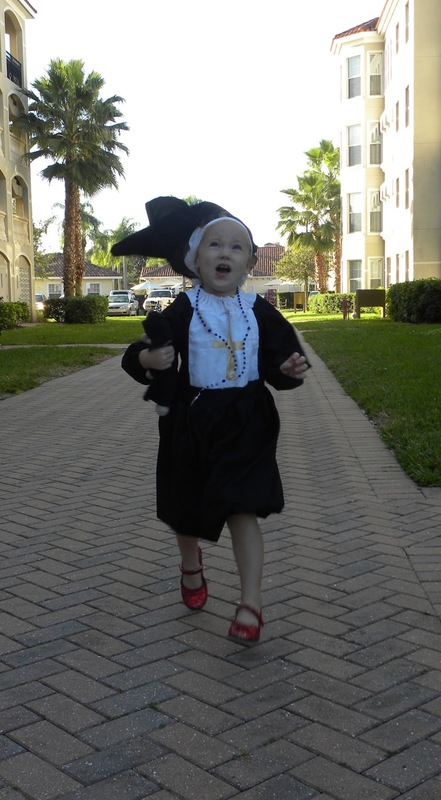 Then there was her evangelization morning as we went to ballet shortly after I wrote the last post. I'd brought along a book to read, and that book had a snake on the cover. "Uh oh." Sadie said shaking her head. "The snake." Of course there was an apple too, so she knew what snake it was. The talk turned to the statue of Mary with her foot on the snakes head, and then there was something about the snakes brains getting squished out, which she thought was quite funny. We got to ballet and got out of the car and she was very serious and said: "Mommy, you need to show all the other Mommy's that book and tell them about it because not everyone knows about God." She has been very into "not everyone knows about God" after watching Song of Bernadette, because that's my answer when she asks why they would threaten to lock Bernadette up for having conversations with the Blessed Mother. Inside I gave an internal wince and a "yeah right" in my head as I pictured how that would go over. We walked into ballet and found out that it was the day the parents got to watch in the class room and I slipped my book into the ballet bag and Sadie apparently inspired to make up for her mother's shyness skipped in a large circle around the room a few times and then skipped right up to the Mom with the I Heart Planned Parenthood bag and said: "I want to be a Carmelite Saint when I grow up!" 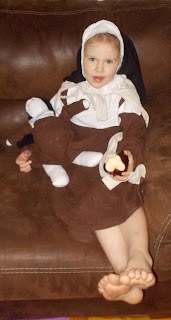 (because sometimes she uses Saint and Nun interchangeably) and then went back to skipping. Well the I heart Planned Parenthood mom needed to know that. You never know what might make her think about your stance and change her mind. If Sadie wants to evangelize the world let her. Really what harm can it cause, she already knows people who don't know God are mean. She really amazes me with her passion (and definitely makes me laugh). Today she stopped a little old man who opened the door for her and after we said thank you said: "And I'm going to be a nun!" Apparently it's something everybody needs to know!